A wide support for different formats. Burn to DVD or upload to YouTube, Facebook and Vimeo instantly. When browsing YouTube videos with your Apple device, you might find something that you like. For a lot of people, the first move is to favorite it and check out the link later. What if, though, you want to watch the video at all times? Whether offline or when the video goes down, you may still want to enjoy it. If you just save the link, that will not help you in these situations. This is why you want to download the video to iPhone/iPad, so you need a video downloader for iPhone. You also can use an iPhone as a magnifying glass. If you want more editing features, you can try a video editing software called Wondershare Filmora which allows you to edit your iPhone/iPad videos on PC and Mac. You can rotate, reverse, crop, cut, add multiple filter/overlays even do some color correction. Wondershare Filmora can give your iPhone videos a Hollywood film looking with ease. After finish editing, you can also directly upload video to YouTube, and download video to iPhone. Note: Although, we have listed few applications in this article but still we cannot be much sure about these iOS video downloader all time availability because Apple App Store keeps on updating its terms on regular basis. You can download these apps for iPhone on App Store. You may want to know how to downlaod iPhone/iPad video easily. Here Document 6, as a YouTube video dowonloader for iPhone, generally allows users to view all kind of videos as well as other media files. This application is available for free and due to its simplest media organization tricks it is gaining more and more popularity throughout the world. If you want to download videos using Document 6 then you simply need to launch this video downloader on iOS 11 and then simply tap over the icon available on bottom left corner. Now you need to type "savefromnet" on search bar and finally hit over "en.savefrom.net" in your search results. Now paste URL of your video on white box, select preferred quality and after renaming it you can save it to your device memory. 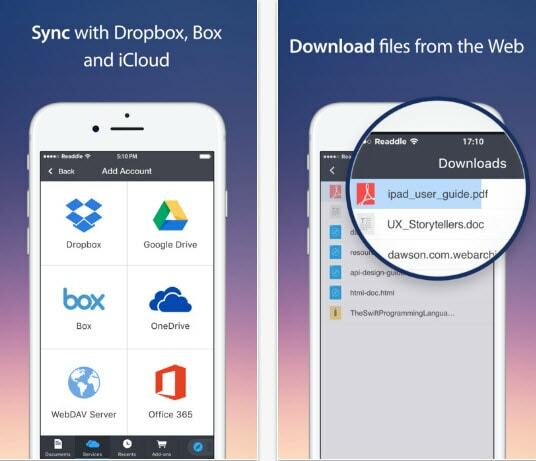 This iPhone video downloader supports almost all popular video file formats and can work with all websites. It is also possible to stream video content directly from internet and users can also manage a playlist by downloading their favourite videos. The best thing to know about Video Downloader Pro+ is that it provides a free trial before you make purchase for this application. It allows users to sort their videos on the basis of type, duration, date and name like details. To get started with the download process, you need to browse the web and then choose your video; hit download button and it will soon be available on your device. My Video Manager application is widely used for downloading video for iPhone files from local network so that they can be later enjoyed via file manager. This video downloader for iPhone allows easy downloading facility via Wi-Fi connectivity over iPod and iPhone like devices so that crazy video lovers can easily watch their favourite stuff anytime and anywhere. This application works with password protection so it is 100% safe to use as no one can access your private collection without your permission. It has special features like multiple file downloading ability, fast downloading and background video downloading. You will be glad to know that this software platform not only provides services for downloading videos on iOS rather at the same time it also allows users to stream content directly to PS4, SmartTV and Xbox etc. You can protect all your favourite collections with password and it is also possible to create bookmarks on commonly used video downloading sites. Users can also pause or resume their video content whenever needed and it will never cause any loss to your resolution. Note that to download videos from this website you need to have iTunes on your device with an active iTunes account. 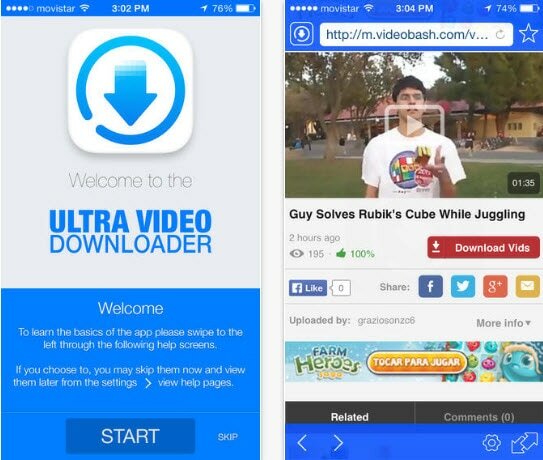 4K video downloader assists users to get their favourite iPhone videos downloaded without suffering any quality loss. It supports almost all popular websites like Dailymotion, Hulu, Vevo, Vimeo and YouTube etc. The downloaded videos can be easily played on iPad, Computer and can also be transferred to DVDs. Users can adjust their desired video resolution at the time of download and it is also possible to watch them online with crystal clear content quality. Compatibility: Linux, Mac and Windows. This free of cost and easy to use YouTube iPhone downloader software is widely used on Windows. Gihisoft TubeSet allows users to download videos from any popular video sharing website without losing content quality. The process of downloading videos is also quite easy where users simply need to get their video URL pasted on a space provided over Gihosoft TubeSet platform, hit the download button and finally get your video saved to your device. Freemake Video Downloader works perfectly with all popular video file formats like FLV, 3GP, WebM and MP4 etc for iPhone video. 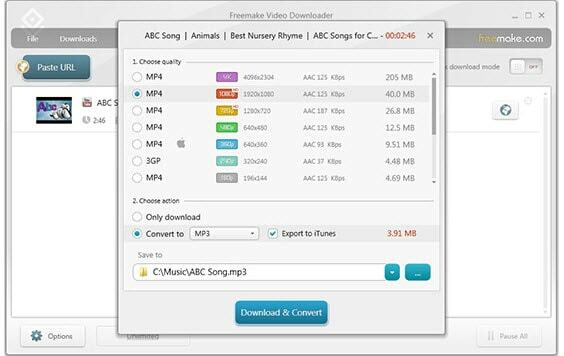 Users can also get their videos downloaded as MP3 music files and the video links can be directly saved on various devices like Android phones, PSP, iPhone, WMV, MKV and AVI etc. It supports HD, Full HD and 4K content quality and takes very less time to complete the video download process for iPad. If you don't want to download any apps on iPhone or desktop, we will also give you a solution online. We recommend using QDownloader as a video downloader for iPhone. It is easy to use with just copy and paste. More importantly, it is totally free to use and offer various export format and size while you download video to iPhone. Check this steps below to find out how to download videos. Step 1: Click here to open QDownloader. You will find a link field where you can paste link from YouTube, Facebook, Twitter. Step 2: Shortly, you will see a download page appear. You can download video or only audio without being charged. Just choose the video quality and format you like to download. Step 3: Click Download to start saving it. It may take a while depending the size of the video. So easy and fast! Gihosoft TubeGet works like a charm, thanks for you sharing. Thank you for your sharing. We will test it and update the article accordingly. Thank you for your sharing. We will consider your suggestion when updating this article. CarbonPlay should be on the list. The ISkysoft iTube Studio is another video Downloader which I prefer. You can easily download the videos from most popular website, such as Vimeo, YouTube, Facebook and thousands of websites. It also allows converting video in any desired format. It is very quick Downloader as compare to others.